Spring has arrived and that means that Easter is right around the corner. After opening up the Easter baskets and hunting for eggs around the house, there is nothing better than gathering the family around the table to devour a delicious feast. If you’re still mulling over your Easter menu, Ream’s Food Stores has a few suggestions that will be sure to leave your guests asking for a second helping. The centerpiece of every Easter dinner usually includes either lamb or ham. 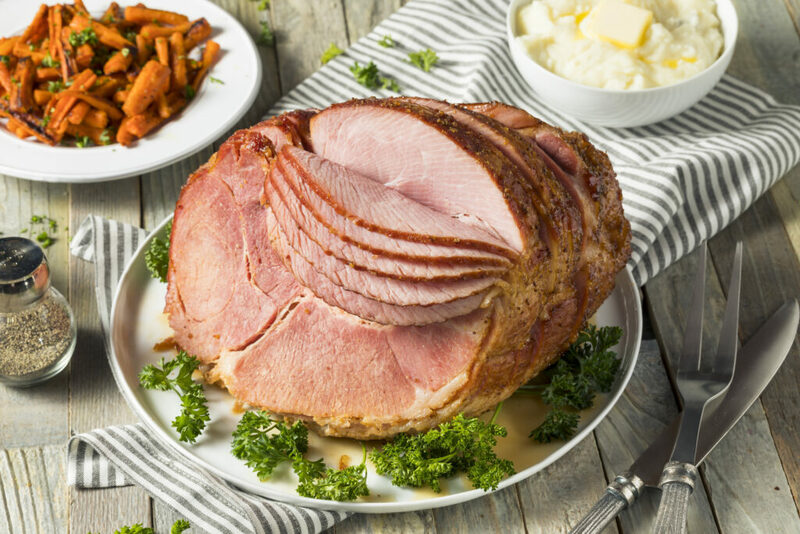 While lamb is very traditional and has roots in early Passover observance, ham has become the staple for most Americans. It is more well known and you want to serve a dish that everyone can enjoy. And come on, who doesn’t love leftover ham sandwiches? Follow these instructions to make the honey glazed ham. While the ham is typically the star of the show, remember that the side dishes also play a very important role. 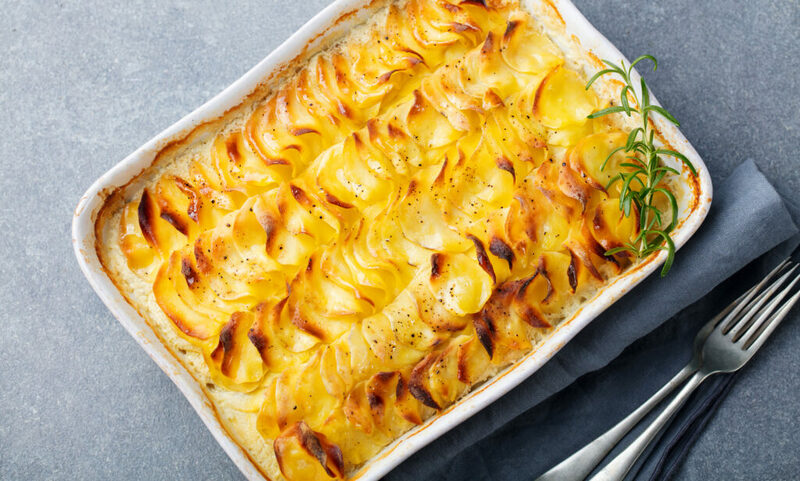 Did you know Au Gratin means sprinkled with breadcrumbs or grated cheese and browned? I don’t think anything sounds more heavenly than potatoes with bread and cheese on top. Follow these instructions to make the au gratin potatoes. Rabbit food isn’t just for the Easter bunny, it’s for all of us. 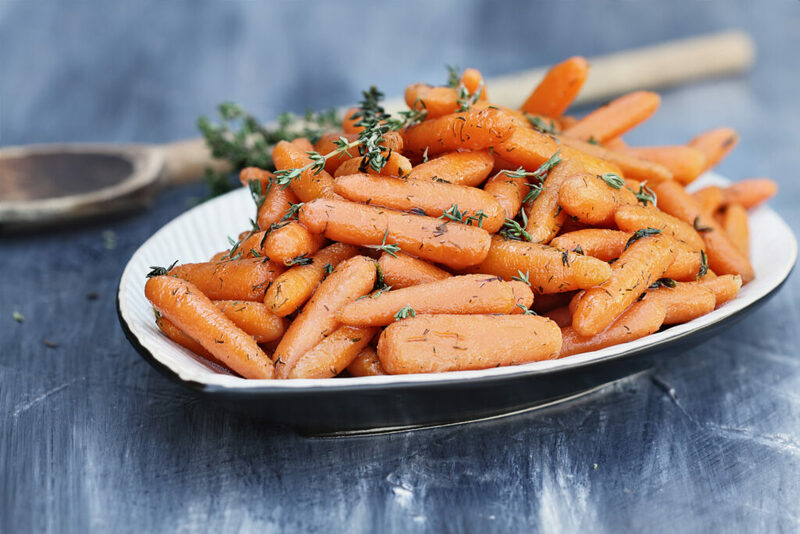 Carrots are not only an Easter themed side dish but they are also nutritional. Sure, adding brown sugar on top may cancel some of that out–but it’s the holidays, who is counting calories anyway? Follow these instructions to make the sweet glazed baby carrots. What would Easter be without eggs? 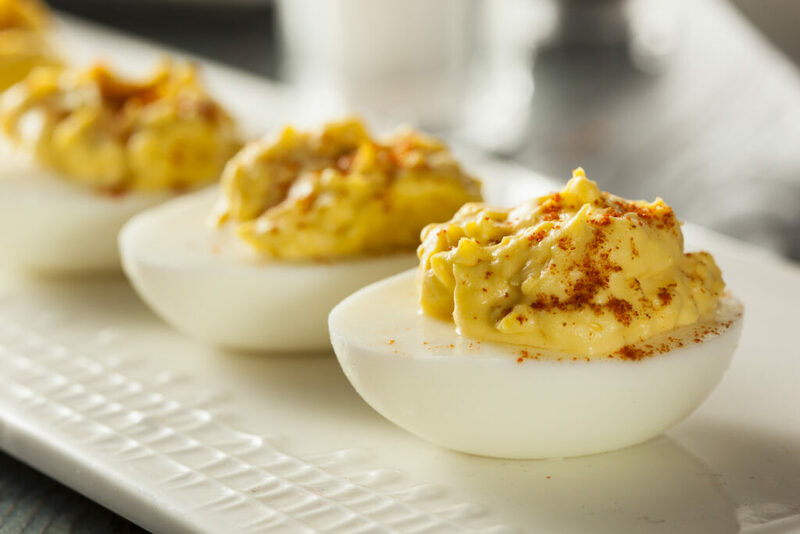 Deviled eggs are a tradition in many households during this time of year. If you don’t want to be wasteful, you can use the same hard boiled eggs from dyeing eggs to make your deviled eggs. The kids can enjoy coloring the eggs and the whole family can enjoy the taste. Follow these instructions to make the deviled eggs. You can’t finish Easter dinner without a festive treat waiting for your guests. 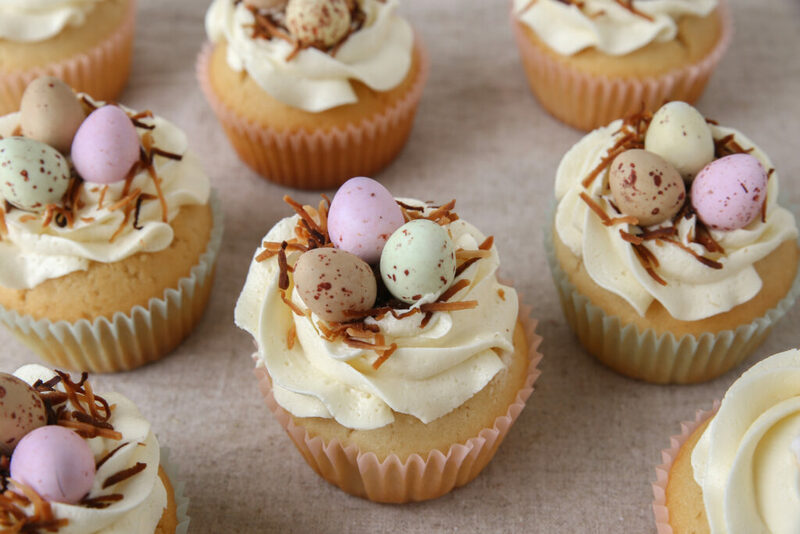 To make these cute desserts, top each cupcake with Cadbury Mini Eggs under almond bark or shredded coconut to make the appearance of eggs laying in a nest. 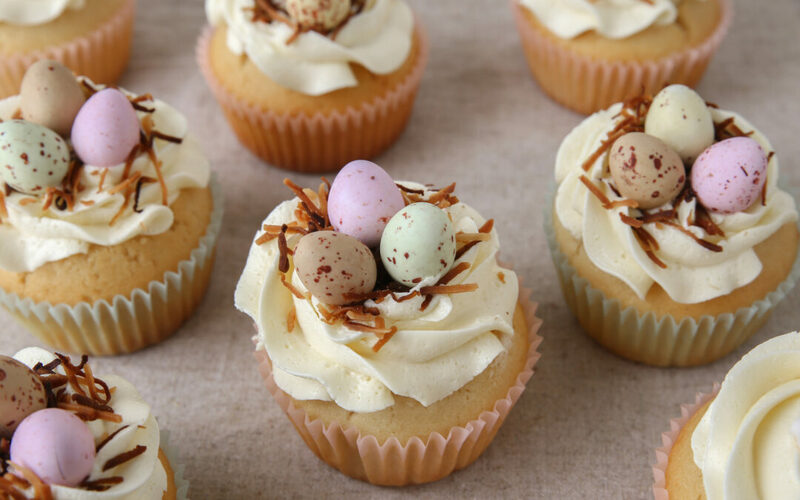 You can make the cupcakes with the recipe below or simply pick up plain cupcakes from the Ream’s Food Stores bakery that you can decorate yourself. Follow these instructions to make the decorated cupcakes.